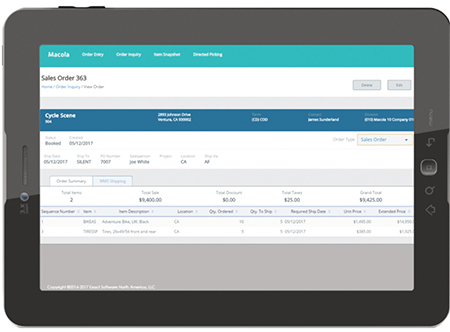 Business-software provider Exact has unveiled Macola 10.5, the newest release of its ERP and business software that’s been enhanced to include usability updates, including new tablet-led user interfaces. The goal: Align the software with how and where its manufacturing and wholesale-distribution customers use it on a day-to-day basis. In addition to demonstrating Macola 10.5 at its annual user conference last April in New Orleans, Exact also described its new Macola Labs emerging-technology development program. And, the company updated its users on the strides it has made with its community-service efforts in the past year. With Macola 10.5, Exact took a tablet-first approach to refreshing its user interfaces, developing a new architecture to offer a stronger experience on tablets in addition to the desktop. The application’s responsive design automatically adjusts to format for the best user experience on whatever device is being used. Mission-critical business and operational data can be accessed on the fly by users, with any updates synchronizing within the application in real-time. This eases order processing and inventory management, giving the user a holistic view of the operation and inventory levels, around the clock. In line with its focus on usability, the software update offers users new functionality so that they can be more efficient, accomplishing more in less time on one screen. This includes new search functionalities such as a type-ahead search that requires less data to be entered than before; infinite scrolling; and sortable table columns.